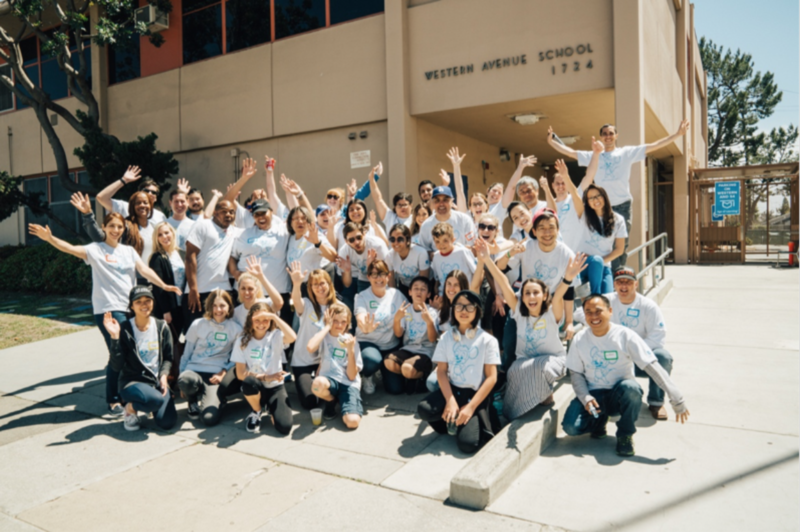 Age of Learning staff and their families recently spent the day volunteering at Western Avenue Elementary School, a Title I school that serves low-income families in South Los Angeles. Our goal was to be a supportive partner in their effort to make their campus a more comfortable, joyous, and inspiring place for teachers and students to thrive. We focused on two high-priority projects: painting a mural for the 1st grade students and upgrading the teachers’ lounge. In February, we held a friendly internal “competition” where we asked Age of Learning staff to form teams and submit design concepts for these two beautification projects. Our talented designers and visual artists came up with six creative, original mural concepts to delight the students, and three teachers’ lounge proposals, which we shared with the school to vote on. After the winning design concepts were chosen, more than 70 staff members from all departments, plus family members, arrived at the school to bring the concepts to life. We truly enjoyed contributing our time to this cause, bonding with our colleagues, and feeling connected to the community.